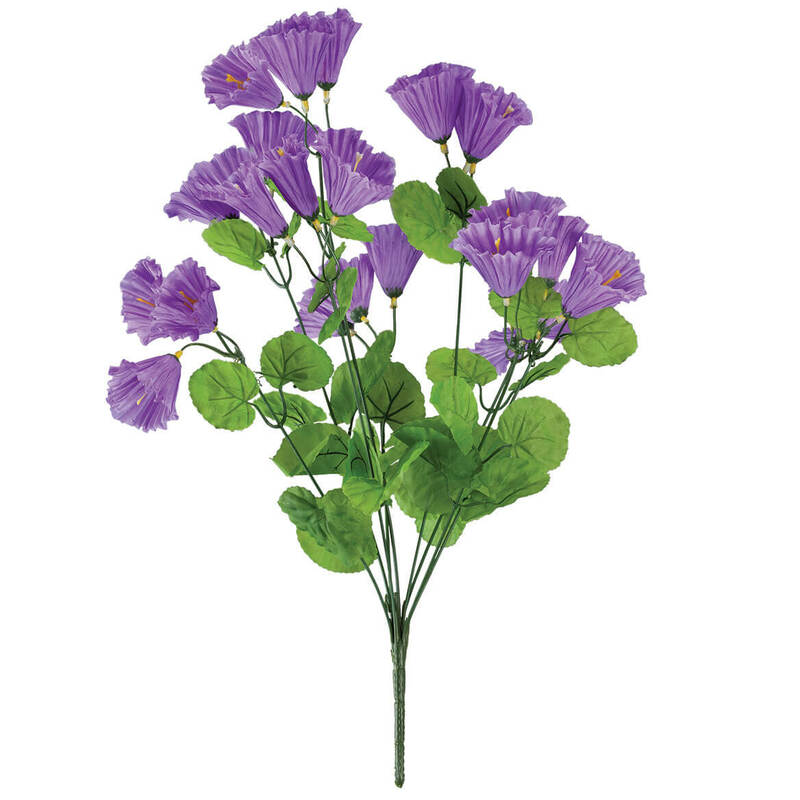 Add 2 Flower Bushes to Cart, Get $1 Off each! This is a five star product! I can't say enough about how pleased I am with this begonia! The product came thru packaged very well, was not crushed, and it came very quickly after I ordered it! I have set it in a planter out in the front yard, and I've had so many compliments on it from people who think it is a live plant! 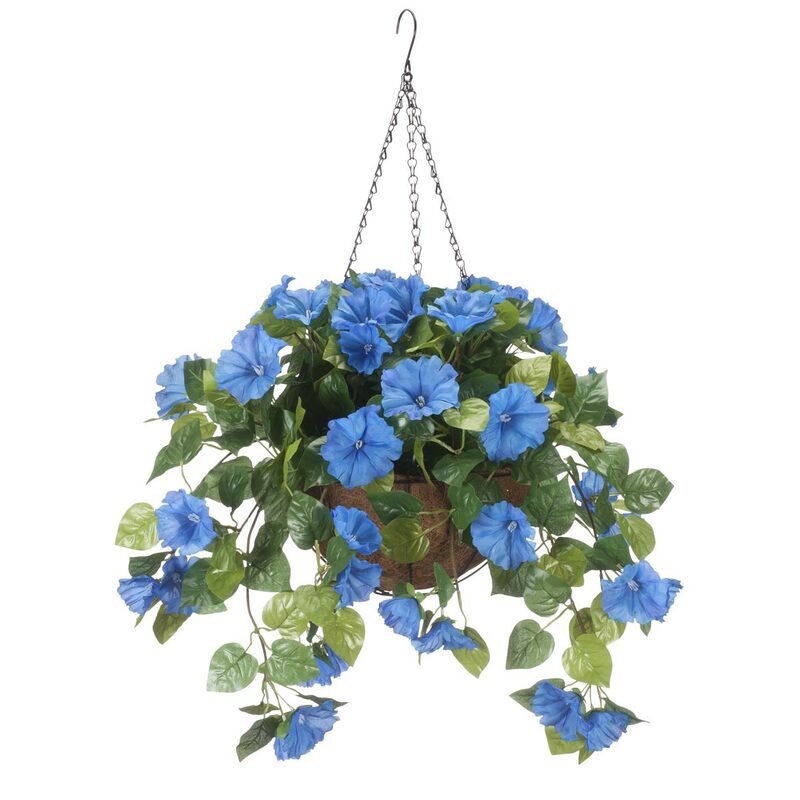 Not only is it an attention-getter, but you don't have to worry about sun, shade, or watering! 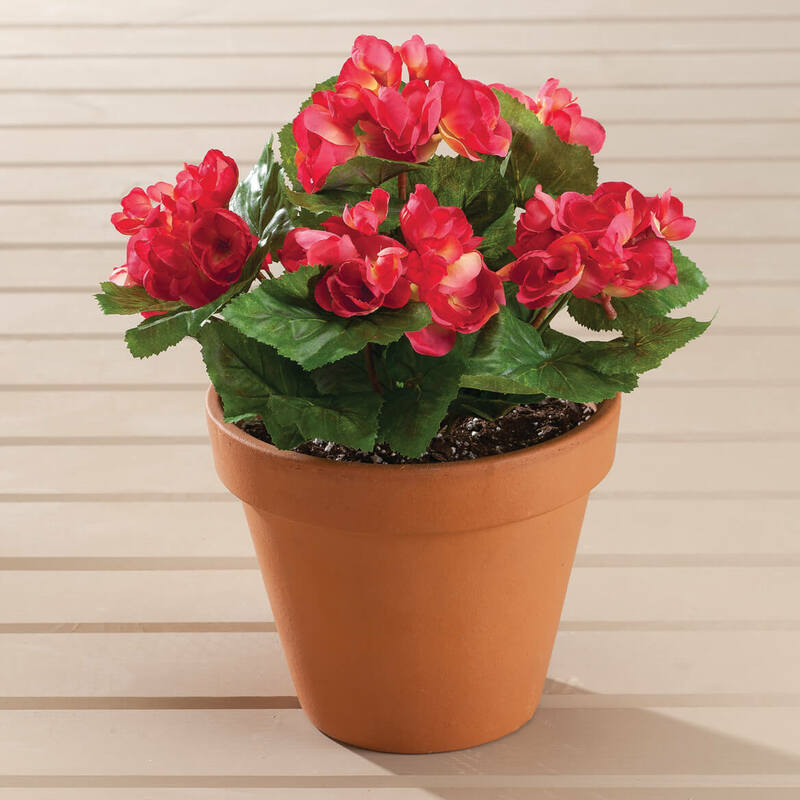 I bought five of the short and one of the long begonias last year. I wanted to add another short plant to my planter to make it look more full. The flowers I bought last year look like new after having them out for a year already. I have them in a raised flower pot that is back in a part of our yard that is swarming with mosquitoes (shady and swampy). The fake flowers look like real, and I don't have to fight the mosquitoes to water them! 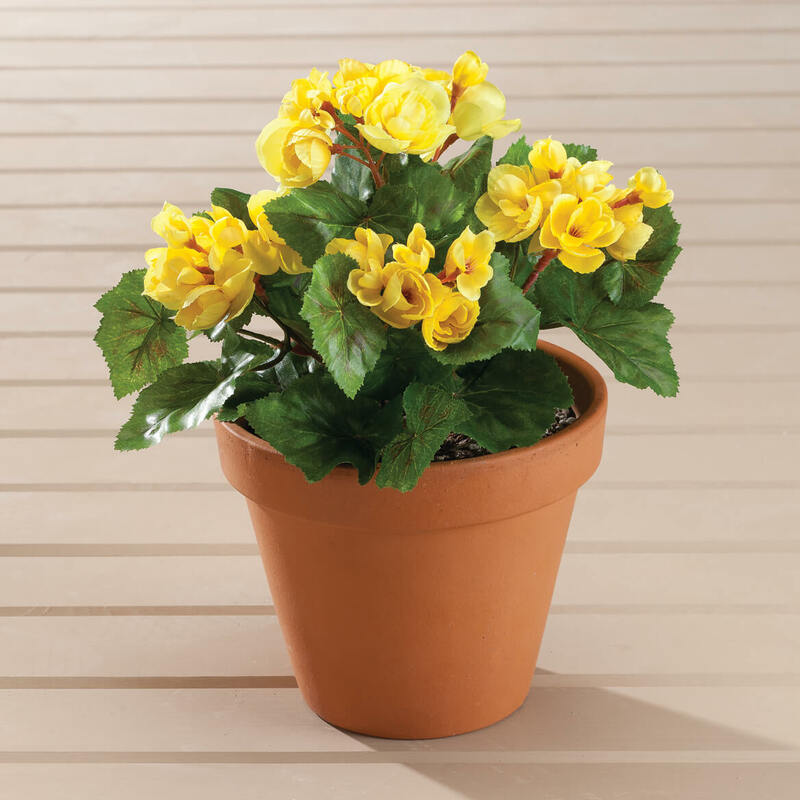 I would definitely recommend these begonias to others. Beautiful and color matches picture. I usually buy artificial flower at a crafts store so I can see what I'm getting, These are at least equal in quality to that, and maybe better. Lovely Begonia Bush - Definitely Recommend! I purchased @ 30 of these bushes to decorate the front yard of my summer home. Since I can't always be there to care for real flowers, these do the trick. They look stunning. The coral color is very vibrant and has a touch of yellow streaming through. I have received numerous compliments on how elegant the flowers look along with the lighting, etc. They have been rained on (unfortunately), but have held up well so far. I'd love to get another season out of them; it really depends on how much discoloration there is at the end of the season. Fingers crossed they'll hold up to the sun. 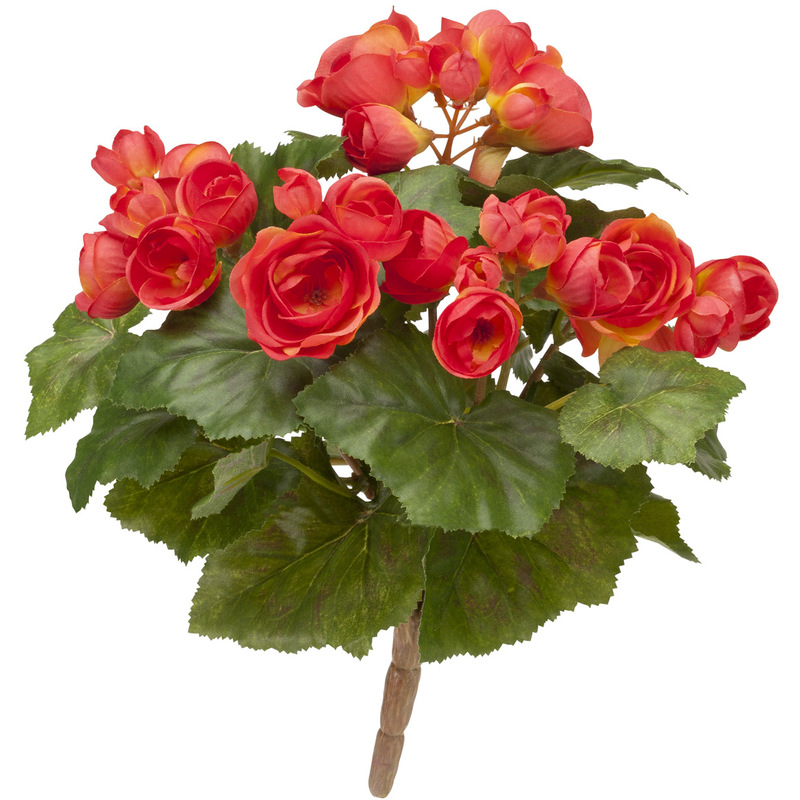 In any event, I definitely recommend this begonia bush and would definitely purchase again. Like them because I can stick them in the ground and it looks so real. They don't look exactly real close up, but they are lovely in the window. And the price is very good for these kinds of things. I used these in two very small flower pots which are under cover. The color, coral, is lovely. They are pretty full, one was enough for each pot but as I mentioned the pots are very small. Bought these to put in a planter that is hard to get at to water. Really looks nice. I should have bought 3 instead of two, but otherwise, worth the money. I bought two this spring. They are beautiful so I bought two more. For neighbors flower box. She is house bound. Thought it would make her smile to see them when she opens her door. The rabbits have eaten $86.40 worth of flowers so will now proudly display flowers they won't eat! I have ordered these flowers before, and my neighbors thought they were real! I had them outside in planters for more than 2 years, and I am just replacing them with new ones. Very pretty colors, and hold up well in our California weather. We did have a lot of rain last winter, and the flowers did well. Was looking for something that stands up outdoors. Comments from other buyers that they hold up well outdoors convinced me to purchase. I love the color and the area where they will be displayed takes a tremendous amount of direct sunlight that is often too much for live plants. In past years the only patio plants that needed my irrigation system were the begonias. 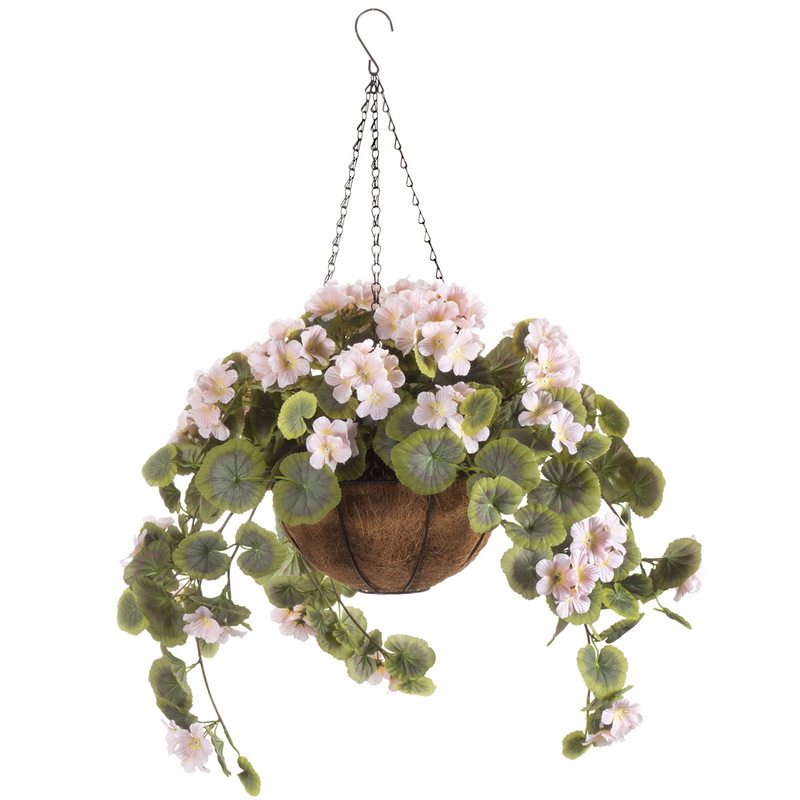 This year I am using the outdoor artificial begonias and am turning off the sprinkler station to the patio. The furniture will stay dry and I will still be able enjoy the color of flowering plants. I have been enjoying the ones I purchased last year. They were out all summer on my deck and have remained vibrant in color. I can no longer care for live flowers or plants, to these give me the same effect without the need to care for them. I like them so well, I want to add to the display. Infestation of gypsy moths. Eating everything so if I want flowers this is it. Ordered these a few weeks ago, and just want more. They are very pretty and realistic. Best of all, no care. Can I buy the plants without the pots? BEST ANSWER: Thank you for your question. The pot is not included as stated in the description. We hope this information will be of help to you. BEST ANSWER: Thank you for your question. These are no UV resistant. We hope this information will be of help to you. I place the Begonia's in a vase under in a covered area away from sunlight. 3 bushes per pot .how wide is the bush in this Begonia picture, how big is each flower and how many flowers per bush?? BEST ANSWER: Thank you for your question. The bush is approximately 7 1/4" wide. 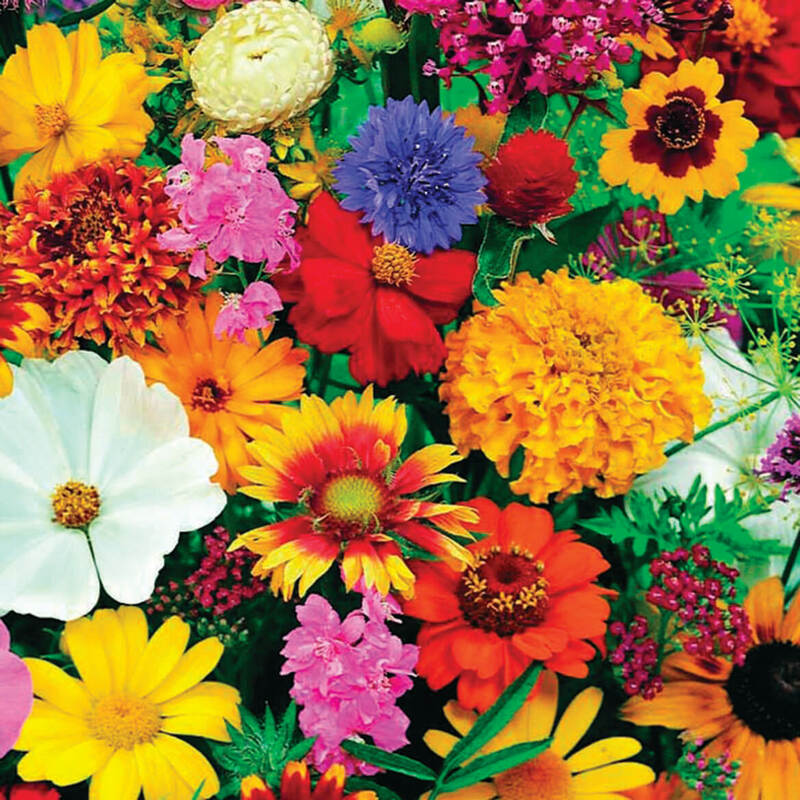 There are approximately 25 blooms on each bush and the flowers are various sizes. We hope this information will be of help to you. 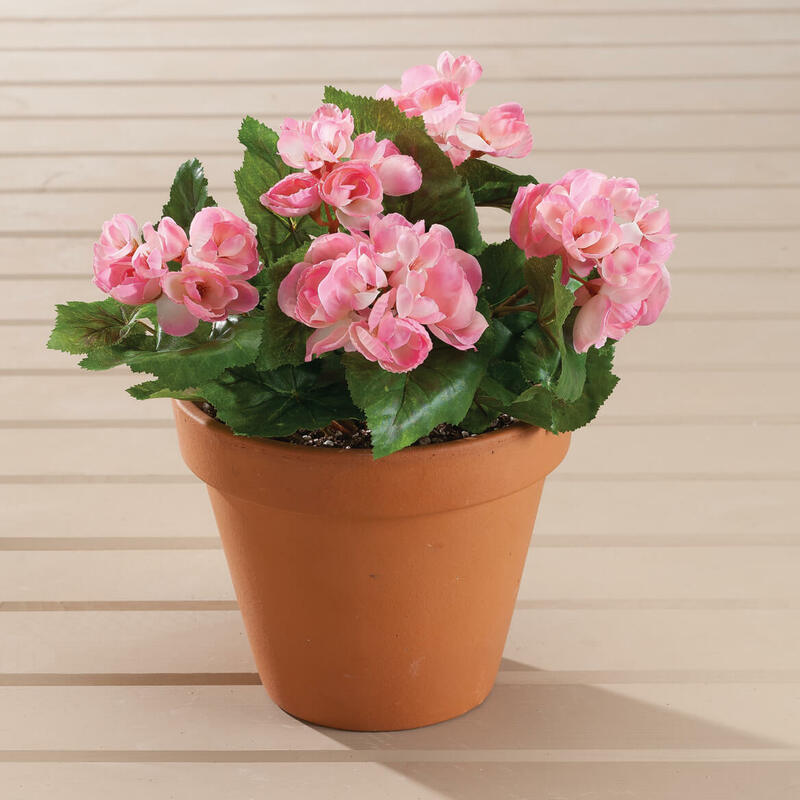 how tall is the begonia plant ? BEST ANSWER: They are 11 to 12 inches tall, and beautiful! 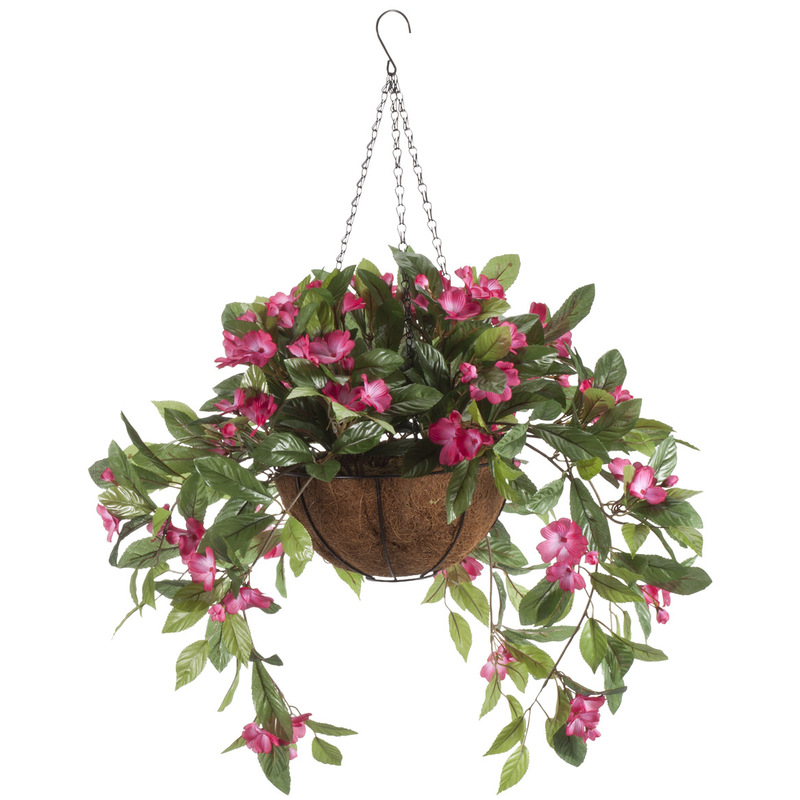 I have some in a low outdoor planter on the patio and also some arranged as a potted plant for the house! I bought these same begonias last year and put them in an outdoor flower bed for the summer. They lasted thru all the hot sun and weather just fine, and had faded only slightly by Fall! This is my second purchase.